Do you remember the first blog you ever read? I do. It was Peanut Butter Runner. I must have googled peanut butter and running or something to that effect and fell upon Jen’s blog which was right around three years ago. I have been a daily reader of Peanut Butter Runner ever since. Peanut Butter Runner opened me up not only to Jen’s world but to the rest of the blog world which is really what paved the way for me starting my own (almost two years ago now!). When Jen tagged me in her survey post on Saturday, to say I was honored would be a complete understatement. She was my first blog ever! To see my name included just made me feel so silly special. Have you ever wondered how I came up with the name, The Cookie ChRUNicles? I like cookies. And I like running. While running one day in January 2013, I thought about cookies, I thought about starting my own blog, I thought about what I would call the blog if I were to actually start one….and a few minutes later, The Cookie ChRUNicles was born. It was the oatmeal raisin chocolate chip cookies which I teased you with last week that originally started up my cookie business back in the day. I really don’t like to (as in, never) share my pride and joy recipes. I am super selfish like that…BUT… I really like you guys. Maybe it’s the FA LA LA that is taking over the world or maybe some sort of kindness is just creeping inside me as I get older. Whatever it is, part of me really wants to divulge some details. You may note in the title of this post that these oatmeal raisin chocolate chip cookies are free from dairy. This was true for the version I made for Thanksgiving but they can also be made with butter. There are so many variations when it comes to cookie recipes, even my own! I made my oatmeal raisin chocolate chip cookies for Thanksgiving and since my family is kosher and cannot serve meat with dairy, my cookie ingredients needed to conform to the requirements. It’s really simple to eliminate dairy. All you have to do is substitute the usual butter with coconut oil or Earth Balance. Or use both which I did in this recipe because I felt like it. 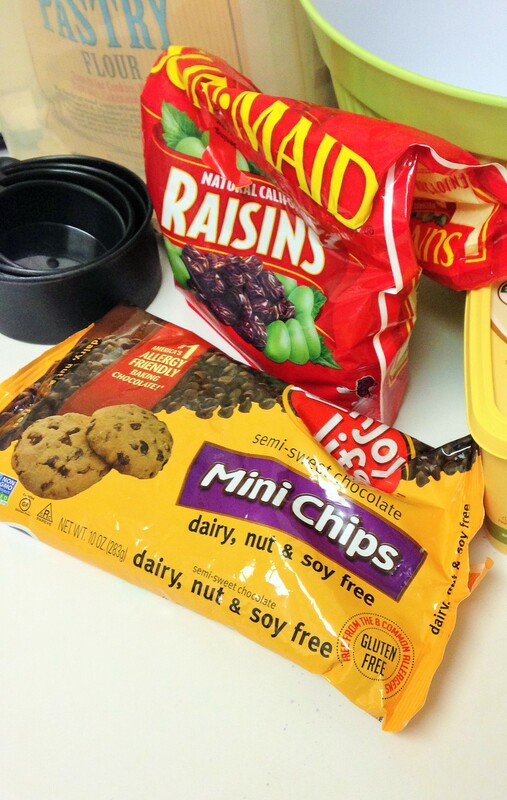 As for your nondairy chocolate chips, Enjoy Life mini chocolate chips work super well. 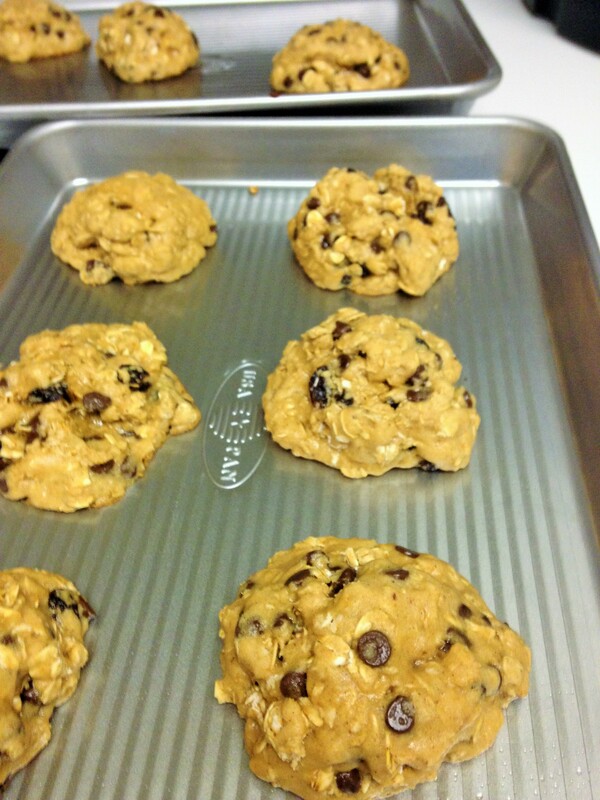 Or, you know, you can make your own vegan chocolate chips. You heard me. Lee, from Fit Foodie Finds, just shared her vegan chocolate chips recipe and it looks so easy! I am fascinated and must try it! *Just because these cookies are nondairy does not mean they are vegan. The recipe still contains eggs. *Don’t ask me why I made these with one organic egg and one yolk; I do not usually, it just seemed like the cool thing to do at the time. They say the egg whites can dry out the dough; did I notice a major difference by eliminating one white? No but the cookies were really good. *I bake these cookies (and most cookies) in a 325 degree oven. I rarely bake cookies in the typical 350 degrees. I even like a 300 degree oven over the 350 degree oven. *I am pretty sure that I forgot the vanilla when I made these last week yet no one noticed. *You do not have to use whole wheat flour at all. In fact, I usually don’t use whole wheat flour in this recipe but decided to get creative and really liked the result. I think you can play around with the types and combos of flour but stick to the total amount of 1 1/2 cups. I can’t say what would happen if the total amount changed. *I never measure cinnamon. Or the salt. And sometimes, I skip the salt for this recipe. *I chilled this dough overnight but you don’t have to — I have made this recipe over and over without chilling the dough. Combine sugars, coconut oil and Earth Balance in a bowl and mix together until well blended. In a separate bowl, combine oats, flours, baking soda, salt and cinnamon and then add to your wet mixture. Add raisin and chocolate chips and mix until combined. If you want to chill your dough, place it in a giant Ziploc bag or wrap with plastic wrap. Chill for two hours or up to two days in the refrigerator. When ready to bake, leave on counter for twenty minutes before baking. Drop cookie dough in rounded spoonfuls on nonstick cookie sheet. You can make these cookies big or small - they won't spread too much but keep them at least an inch apart to be safe. Bake for ten minutes or until edges look a little brown (check on them because every oven is different). Transfer immediately to wire cooling rack. If you don't wish to use Earth Balance, add extra two tablespoons of coconut oil (room temperature). To make this recipe using butter, replace coconut oil and Earth Balance with 1/2 cup plus 2 tbsp. of unsalted organic butter (room temperature). I can go months without baking but once I start, I can’t stop! With the holidays coming up, would you like to see more cookie recipes and if so, are you okay with the real stuff versus the healthified stuff? I mean, even though we are using flours, eggs, sugar, oils (or butter), the recipes are still free from artificial junk and preservatives and we are still making use of quality ingredients and organic when possible. The real stuff makes for a better dessert platter should you want to bring something sweet to a holiday party or wrap them up as a gift. Nothing says love like a cookie. Do you prefer your cookies thin and crispy or thick and chewy? What types of cookie recipes would you like to see as we approach the holidays? Do you remember the first blog you ever read? Do you still follow it? Confidence-Boosting Tips Plus $100 Visa Gift Card Giveaway! Ah, the infamous recipe! i’m sure that your’s will still be better than I ever could make. 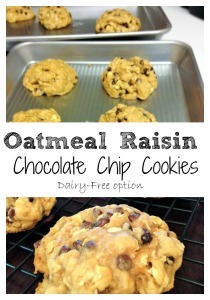 I absolutely adore chocolate chip oatmeal cookies, and I like that these also have raisins in there, too. For me, I like a bit of it all with a cookie–it has to be chewy, but it also has to have a sense of an edge–you know me, I’m a texture junky. I had a cookie with too much brown sugar in it the other week, and it was rock solid. Great for crumbling over things, but otherwise inedible! Susie @ SuzLyfe recently posted…Thanksgiving Week Recap and Suzlyfe Fitness Giveaway Hop! I prefer cookies with higher brown sugar to regular sugar but can imagine that it’s possible to overdo it. These cookies are terrific – because of the cinnamon and raisins, they are more of an oatmeal raisin cookie just with chocolate chips for added fun. P.S. These look delicious. I think I have already told you this but I love adding oats in just about everything. I love giving cookie platters as gifts, especially when people aren’t expecting them. It takes so much more effort and thought to bake something up than to buy a gift card. I always thought your blog name was one of the coolest ones out there, and now I know the story behind it! Awesome! I have no idea the first blog I read, but I know I was obsessed with cookies and cups at the beginning. She was like my idol……just not exactly healthy for my running hahahah! Cookies look great to meeeeeee! I follow Cookies and CUps too! Looks yummy! I find that coconut oil subs in so well for butter with cookies. I was just thinking about what holiday cookies I should try to make last night but haven’t come up with much yet. I get overwhelmed when I start thinking baking recipes. I have so many, see so many new ones and can never decide. That’s when I end up making them all. I have lots of platters to give so it’s fine! The first blog I ever read was Peanut Butter Fingers! I remember my friends told me about it and I didn’t really get the idea of a blog but checked it out anyway. I am really excited to do some baking over the next few weeks. I like to make some that are “healthier” and others that have all the real, good stuff. These look great! PB Fingers was one of my first blogs too. And I still read every day. Never had an oatmeal raisin chocolate chip cookie in a restaurant that can rival mine! I think the first blog I came across was Oh She Glows, and I definitely still read it because Angela’s got some pretty epic recipes. Speaking of which, I can’t believe you finally shared your cookies! 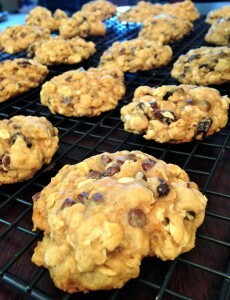 I’m ALL about the thick and chewy cookies, with chocolate chip oatmeal being my absolute favourite. And I have no idea how I’m going to approach holiday cookies on the blog this month either… I have so many ideas, but I’m not sure if people will get sick of them. Or if that’s even possible. Amanda @ .running with spoons. recently posted…. currently – december 2014 . I love Oh She Glows, definitely one of the first blogs I read and still read. I love ALL the cookies, just depends on my mood that day. Thin, crackly lace like cookies are sooo delicious, yet I adore thick, rich and chewy cookies too. Adding oats is always a winner in my book; they add so much to the texture. THANK YOU for sharing your recipe, and I’d prefer to have mainly the real deal and richer cookies this time of year. I like a little indulgence and think it’s all part of a good balance so bring on the butter (or Earth Balance), sugar and eggs. I’ll eat them with my plate of veggies, or really right after.